New York, NY – 11 Sep 2015 – Rockready names Rotosound as the exclusive distributor for the UK. Rockready is pleased to announce that Rotosound will distribute Rockready products exclusively in the UK. The announcement was made just this week but the two companies have been working together since March to bring Rockready to the UK. Rotosound has just received it’s first shipment of Rockready Volo gig bags and has started fulfilling orders to UK music shops. The Rockready line – designed by musicians for musicians – looks to innovate some everyday tools essential to musicians. The Volo gig bag solves many issues with some simple and elegant solutions. There’s a dedicated phone pocket that’s easy to reach, a clip to hold your keys, backpack style straps for comfort with a chest clip for long treks, reflective piping for nighttime safety, a locking zipper for security, a neck holder, and the list goes on. There is also an optional Volo Mini bag with dedicated tablet pocket. It’s the perfect companion to the Volo or perfect to use on it’s own. For those of us that aren’t hip, tell us why they call you the ‘workingest’ bassist in Chicago? Back in the 80’s I toured with Dave Mason and gigged with The Nitty Gritty Dirt Band, John Denver and Phoebe Snow to name a few. Plus a lot of session work in Chicago when there was session work in town. What’s happening now for you? I was was hired recently by DEACON BLUES, they’re America’s premier Steely Dan tribute experience. The group began when eleven Chicago-area studio and stage musicians agreed to form a jazz-rock vehicle to honor the music of Walter Becker and Donald Fagen. What role does education play in music? Now more than ever education has to be about the Music Business. Can you understand the contracts you sign etc.. When I was young I was touring at 17 so I didn’t get the Music Business savvy side of things. I learned on the job. You gotta be prepared for so much. Learning to be fluent in different styles of music, to read music, to be courteous and on time. That’s all part of it. You gotta learn how not to get taken advantage of. Where do you see the future of music going? I hope we’ll get back to real music. There’s so much sampling going on. Kids today don’t know the original artists. There are some great new artists out now like Esperanza Spalding. As long as people continue to enjoy music the sky’s the limit for music. What do you like about your Volo gig bag? I just put my bag to work this past weekend! And I’m already hawking the bag to everyone I run into! I even threw my bag across the stage to show them the protection it gives! Best part is I have a Sadowsky bass in the bag!! They say I’m crazy but they now know this bag is the bag they want!! I’m very impressed with my bass bag and all the features it has!! There seems to be pockets in the pockets for storage of all your cords, tuners, strings, effects, my iPad, phone, keys, etc… I could go on and on!! I’m just talking about the mini bag! Plus the storage in the bass bag!! This sounds like a commercial to me!! Ha!! And it glows in the dark!!! The bag will sell itself ! Great job on the bags, Ed!!! It’s like having a hard shell case only lighter and you can strap it to your back to get to the gigs!! Click here to visit Wally’s Rockready artist page. Rockready Volo Gig Bags Shipping Now! 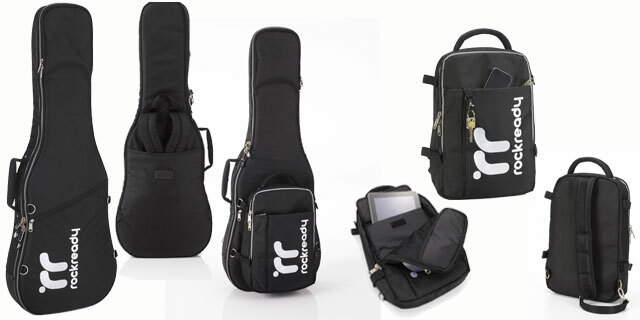 Our Rockready Ready Volo gig bag is in stock and shipping now! We’re packing them up as fast as we can to meet the demand. The bag is already going out on tour with some pretty big names including Vashon Johnson (Miley Cyrus), Booker King (Santana, Paul Simon), Zak Loy (Alpha Rev, Ed Kowalczyk), and Wally Hustin (CCR, Dave Mason).